The newest product in the Grahams range the Aloe Mineral Deodorant is formulated especially for sensitive skin. The Aloe extract gently moisturizes and soothes sensitive skin. 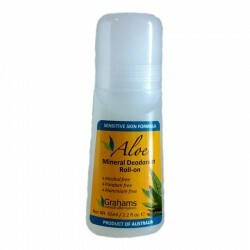 Grahams Aloe Mineral Deodorant is Alcohol free, Paraben free and Aluminum free. It is long lasting and does not leave a white residue. Contains Aloe extract which will help to soothe and moisturize the skin. Must be applied to clean, dry skin. Suitable for men and women. Purified water, Potasium Alum, Xanthum Gum, Aloe Barbadensis Leaf Extract. Store in a cool, dry place and keep away from children.